Walter’s Ranch is an integral parcel in Cal Poly’s land holdings and home to commercial and purebred cattle. Several students live on site to tend to the cattle. Uniquely, the site is located on a slope, and animals are fed at the top of the hill to encourage exercise and proper fattening. Narrow strips of land run up the hills between pastures. 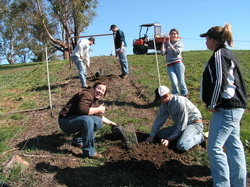 Early in 2009, Lionel worked with the Cal Poly rodeo club to plant trees on this land seeing their value in stabilizing the slope, shading the livestock, and beautifying the area. Long in the future, the acorns of the oak may provide additional forge to the cattle, as is common practice in Spain and Portugal. More trees were planted in a windbreak around the on-site residence, and around an eroding ravine along the road to the beef unit.